We are offering two special pre-rally classes at the march 2015 Tucson Escapade. Hands on with your smartphone or tablet. One 6-hour class on Apple iPhones and iPads. Another 6 hour class on Android phones and Tablets. Do you think your smartphone is smarter than you? Do you have questions about what you can actually do with these devices? 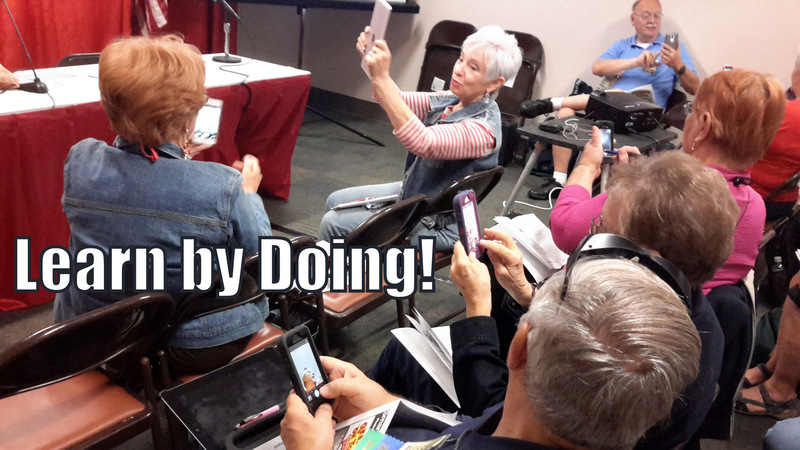 How can you learn to use your phone or tablet? Jim and Chris Guld of Geeks on Tour think the best way to learn is by doing. This class is 6 hours of hands-on training with your Android phone or tablet. You’ll be paired with someone else in the class and you’ll have hands-on exercises to learn some basic features as well as Tips and Apps specifically for travelers. Basics: understanding accounts, connecting to the Internet with cellular or WiFi, turning your phone into a Hotspot for your computer, tips for using the touchscreen, keyboard, settings, and organizing your homescreen, camera basics, downloading Apps, and scanning QR Codes. All this while actually using your device and learning many more things that weren’t even planned! Note: Since we’re teaching tablets as well as phones, we won’t be dealing with voice call issues. Time permitting, we will cover making video calls with Skype, Facetime, or Google+ Hangouts. In this class, you’ll need your smartphone or tablet fully charged. The class is limited to 20 people – 10 buddy teams. You will receive a detailed workbook. This class is designed for beginners, but not complete beginners. For example, we expect that you are already sending and receiving email on your device. Even if you’ve had your device for a while, we know you will learn something! Bring your Android phone or tablet fully charged, and also bring your charger because 3 hours of constant use can drain the battery quickly. Pre-registration is required including a fee of $69, call Kim at the Escapees office: 888-757-2582..
Do you think your smartphone is smarter than you? Do you have questions about what you can actually do with these devices? How can you learn to use your phone or tablet? Jim and Chris Guld of Geeks on Tour think the best way to learn is by doing. This class is 6 hours of hands-on training with your iPhone and/or iPad. Basics: understanding accounts, connecting to the Internet with cellular or WiFi, turning your phone into a Hotspot for your computer, tips for using the touchscreen, keyboard, and organizing your homescreen, camera basics, downloading Apps, and scanning QR Codes. You will need to know your AppleID AND Password! Note: Since we’re teaching iPad tablets as well as phones, we won’t be dealing with voice call issues. Time permitting, we will cover making video calls with Skype, Facetime, or Google+ Hangouts. In this class, you’ll need your smartphone or tablet fully charged. The class is limited to 20 people – 10 buddy teams. You will receive a detailed workbook. This class is designed for beginners, but not complete beginners. For example, we expect that you are sending and receiving email on your device. Even if you’ve had your device for a while, we know you will learn something! Bring your iPhone and/or iPad fully charged, and also bring your charger because 3 hours of constant use can drain the battery quickly. Pre-registration is required including a fee of $69, call Kim at the Escapees office: 888-757-2582.